So I found out they were right. 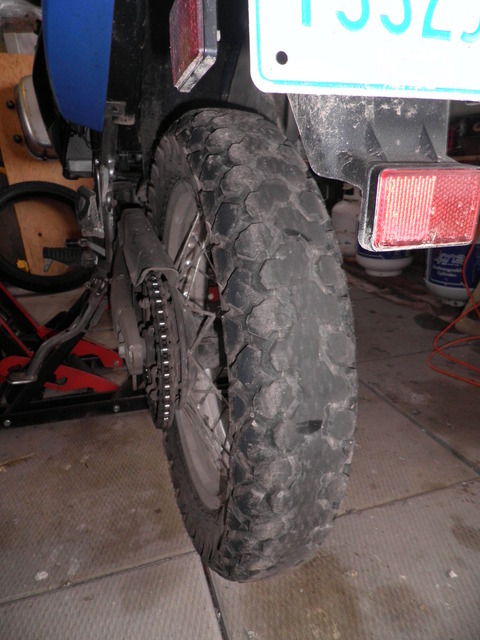 Tire manufacturers don't recommend high speed on knobbies. They MELT at 120 KPH! Basically, 3 rides in to work on the highway (300 miles - total) and my 1/2 used knobbies turned into Italian racing 'Baldeenees'! Now I'm certified to be a 80% road raced, and a 20% dirt hero! Since it finally stopped raining today, I'm off to test 'em tomorrow morning! I wonder where I can find a road that is 20% dirt?? PS... Smilo, you'll notice I still have not used the sink! Re: There! Back to road racer again! So perfect day, and I sneak out before anybody notices the lawn hasn't been cut, or that bush by the garden has not been trimmed yet! Looking for that perfect 80% road isn't going to work, but I found a 100% 'off-road' road that will be a good test. 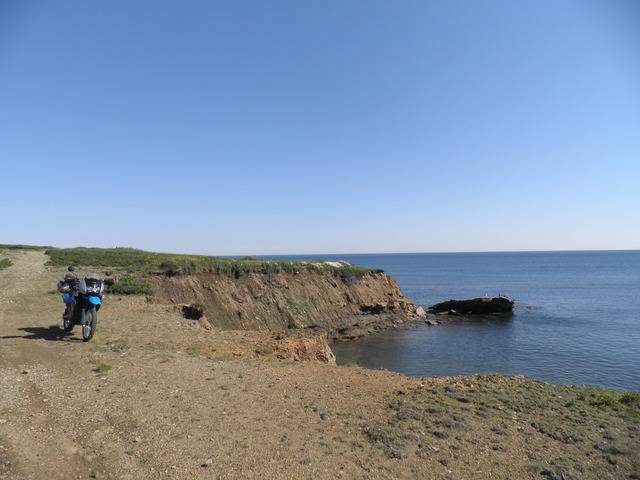 It's an ATV trail that skirts along the cliffs near Morien (in Cape Breton, natch...). Not something you'd take on a day when the Sow-west winds are howling! Good mix of easy stuff with a few "I shouldn't be here' thrown in for good measure. 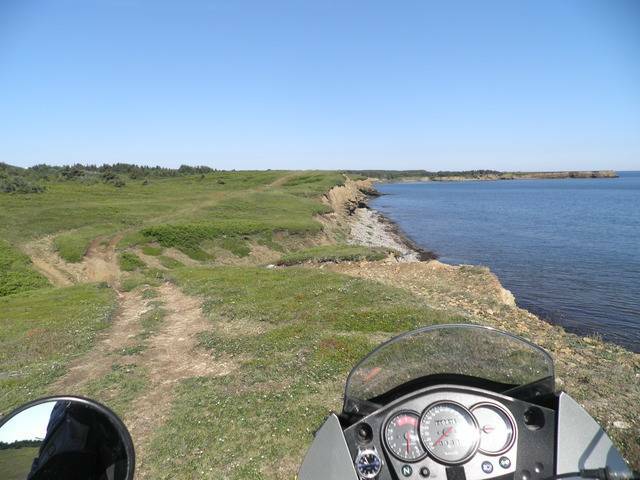 Excellent views (there is a HUGE underwater coal mine out in the distance - You can't see it of course, it's about 10 miles out and 500' down. ), just stay away from the edge. Anyways... Perfect test roads. Tires are excellent. Lean angles tested on the ride back home on the nearby wiggly asphalt bits. 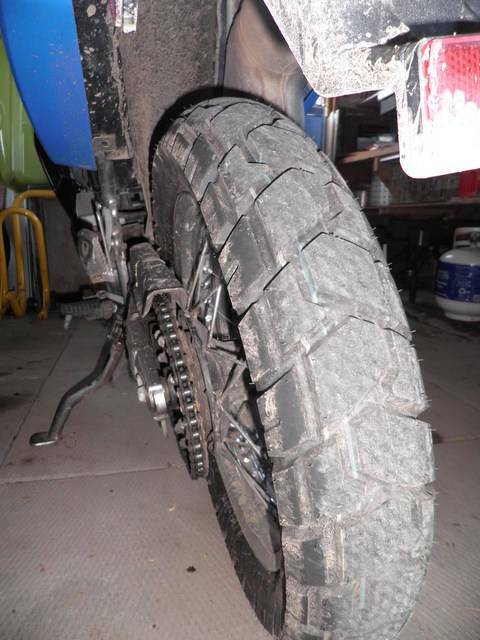 150KM and I'd say the tires are nicely broken in! In it's day, the big KLRs were the the heaviest thing on knobbies. Of course, now-a-days with "adventurer" tourers, it's a lightweight. I imagine they have a lot of new "on/off road" tires for those big beasties that can handle that weight on a highway trip. Yeah! I was surprised at the number of offerings. The 'adventure riders' on some forums are always arguing/comparing tires for their BMWs and KTMs and Teneres and the like... I went cheap for this go. Seem to be mostly good reviews for the Shinko. Some of the other tires were twice the price, but I'm not headed to Alaska this fall! I was just thinking though, how skinny the 130/80-17 rear looked compared to the tire on the Ninja. The conversion for the KLR tire works out to be actually wider than the 4.10 TT100 Dunlops on my CB650 (back in the 70's!). Cheaper too! I remember paying about $80 for a rear tire back in the day. That would be about $800 now, right?!? I was just thinking about that this afternoon. 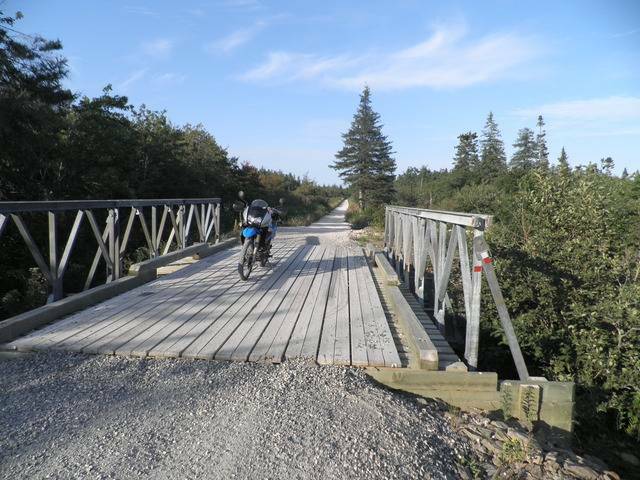 I was riding back along a wide gravel road that connects two paved wiggly roads. Again, looking for the 80%! 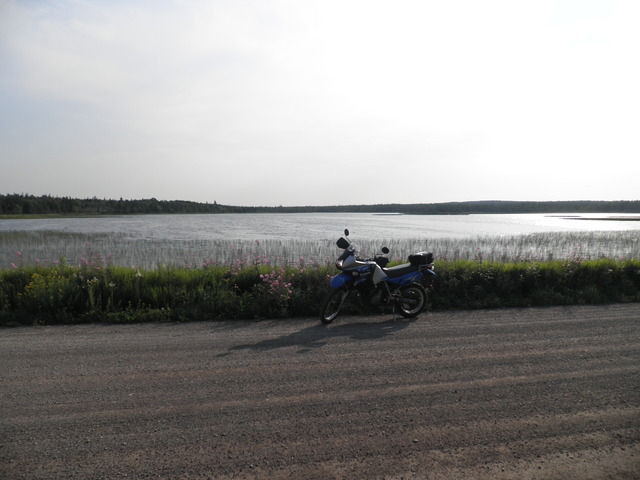 There... More water in the background, only this time it is a little lake, not the North Atlantic! Anyways... There were several little trails off the main road that I was dying to go explore, but big pig 650 is just too much of a monster to go play in little trails without somebody around to help you out when you inevitably get into trouble. So now I need to keep the Ninja and the 650, but also get a Sherpa 225, or maybe a KLX250... Yeah... That's the solution Eddy! Keep the Pan and get a 250 to carry along in the panniers! is the Shurpa what we call the Serow over here ? 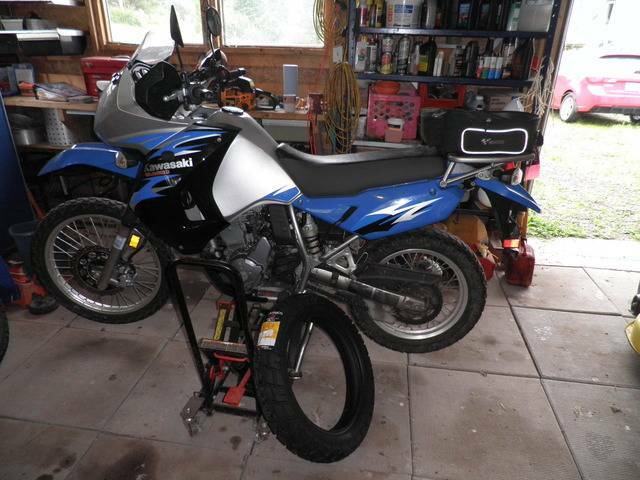 we do get the XT 250 and 225 serow here mainly as gray imports , the Sherpa I just can't place , but something along those lines would be nice for local rides but if I am to sell the Pan I would want something that is good for longer road rides so really seeing as I have the DT stinker for local hooligan stuff and a C90 Cub project due on the road in the spring , what to get that is light comfortable and capable of doing up to 200 mile days I just can't make my mind , but am in no rush with having just spent on new rubber and done the swing arm and a service on the Pan , I keep thinking why bother once out of the garage and the feet are on the pegs , man and machine are at one , and well capable of eating the miles , no probs , is the Grass really that much Greener on the other side ?? Here you go... Extinct now though. I think last ones were in 2010 or so, but you see them reasonably often on the 'used' circuit. Usually quickly bought up by the kid brother or something so you've got to be quick. Consider them to be a 'grown up' Honda 90. 225CC so it sounds like what you guys call a Serow. A little small for the highways around here, but perfect for back lanes and the occasional dirt road. Yup. Yamahas are still XT's here, but I think there is only a 250 left. 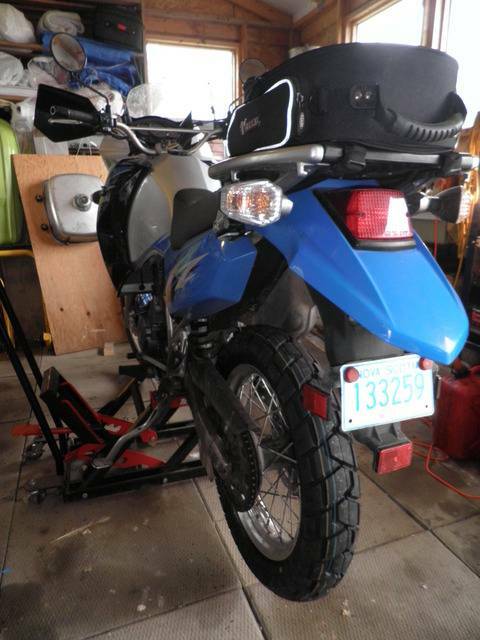 Suzukis are DR and the 650 version is an air cooled version of the KLR but a bit shorter on the inseam (Tim has one). 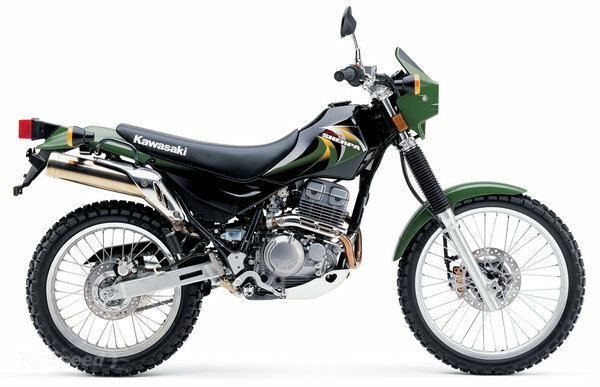 Kawasakis are branded KLX then, and of course, Hondas stick with XL and XR. It just seems to be the names that get changed. Serow = Sherpa (? ), Pans in Europe never got a name over here and were just referred to as ST1300, Suzuki650GSF's were not called Bandits, Honda VTR1000 were not called Firestorms and 699s were not known as Hornets. Marketing men must laugh and think it's all a joke! The cool thing I liked about the Sherpa was the big wheel/tight fender front end that looked more like a trials bike than a 'scrambler'. More honest, you know? 99% of them never went near a mud puddle! 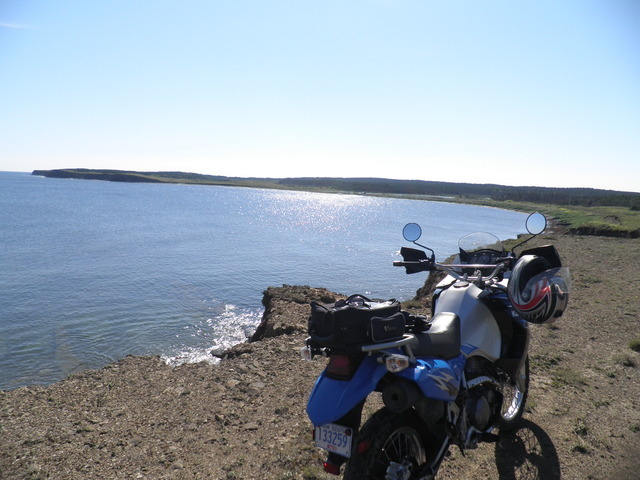 Getting a fair amount of miles on the KLR after the tire transplant. Mostly back and forth to work tho', so I had great hopes for vacation and some REAL traveling. Not to be so far! Spent much time moving rocks and building decks and cutting back the weed jungle. I'm a little worried about looming retirement and all that entails. I'll need a schedule! Did manage a little jaunt to track the old railroad bed from the coal mines to the shipping port. 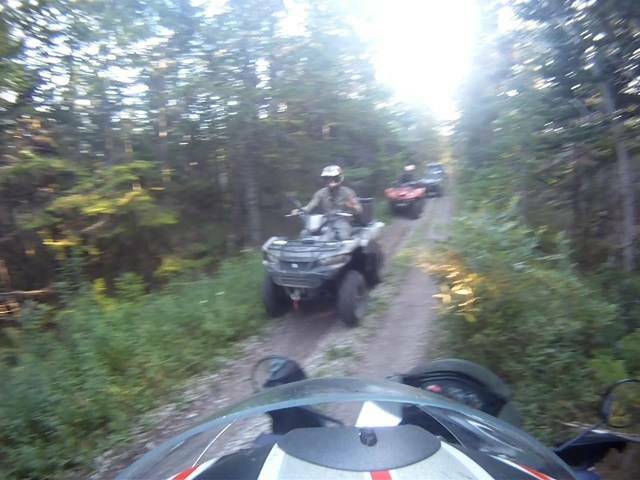 This was abandoned in the 1970's, so is much overgrown, but the ATVers and Snowmobilers do work on it from time to time. 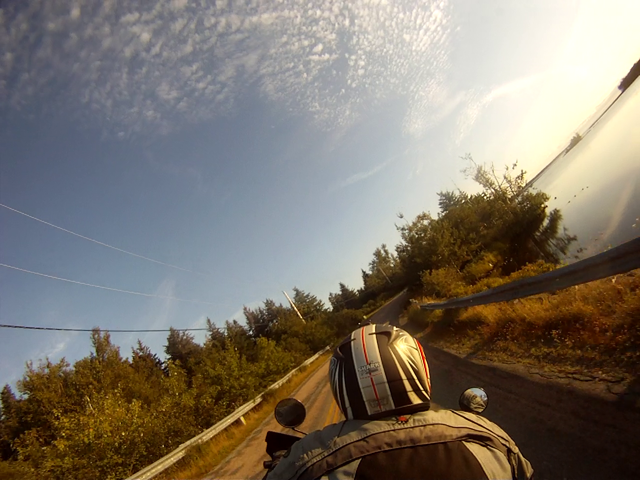 Don't think they were ready for a street bike in that far. Hmmm... 'Gyro' you say, eh? ?